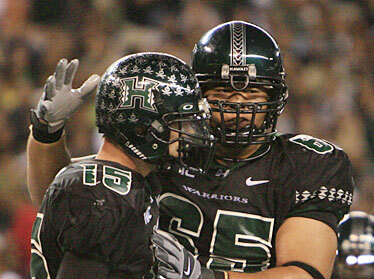 June Jones believes that offensive lineman Hercules Satele will be be in the NFL next year along with Colt Brennan. When the Hawaii football team straps the pads back on Thursday to prepare for its first BCS bowl game, it'll have a freshly-minted All-American in its midst. Left guard Hercules Satele was named to the Football Writers Association of America first team over the weekend. Satele was the only Western Athletic Conference selection on the list, while the Big 12 placed a total of seven players. The other offensive linemen on the team are Anthony Collins of Kansas, Jake Long of Michigan State and Ryan Stanchek of West Virginia. Jonathan Luigs of Arkansas is the center. Satele is the first UH player to be named to the team, which began in 1944. Past winners from Hawaii are Herman Wedemeyer, who played at Saint Mary's in 1945 and 1946, Al Harris of Arizona State in 1978, Dominic Raiola of Nebraska in 2000, Toniu Fonoti of Nebraska in 2001 and Chris Kemoeatu of Utah in 2004. The 12-0 Warriors' practices in preparation for the New Year's Day showdown in the Sugar Bowl against No. 4 Georgia will be closed to the public from now until the team's departure for New Orleans on Dec. 26. The Associated Press is scheduled to release its All-America team selections by noon Hawaii time today. With all the unprecedented attention being given to BCS-bound Hawaii and its Heisman finalist quarterback, is it really surprising that a simple All-American award would escape the attention of coach June Jones? Offensive lineman Hercules Satele was named to the Football Writers Association of America's All-American team over the weekend, when all eyes were on New York and Colt Brennan at the Heisman Trophy awards show, where the quarterback finished third. "That's pretty awesome," Jones said when told of Satele's accolade. "That's the first I've heard of it, but he's certainly deserving. He's had a great career, and he's played very well last year and this year. Pass-protected as well as anybody in the country." The 6-foot-2, 293-pound senior left guard is part of a Warriors front that allowed only 26 sacks during the regular season -- an average of just over two per game -- despite the quarterback being the obvious focal point for defenses in Hawaii's pass-happy run-and-shoot offense. His relative, Samson, was named to Sports Illustrated's second team at center last year before being drafted in the second round of the NFL Draft by the Miami Dolphins. It wouldn't surprise Jones if the younger Satele followed in his sibling's steps to the next level. "I would think Herc would certainly get his opportunity to prove what he can do, and I think he'll get better when he gets into run blocking and other schemes," said Jones, who just returned from a book signing on Kauai. "He'll be a real powerful player. "They're two very physical players, and you want 'em physical in a pass offense," the coach added of the similarities between the two Sateles. Satele and Central Florida running back Kevin Smith were the only non-BCS conference selections on the FWAA offense or defense teams, and Satele was the only player from the Western Athletic Conference. The FWAA, made up of media writers of each conference in Division I college football, only selects a first team. When Satele came to Hawaii in 2003 out of high school powerhouse Long Beach (Calif.) Poly High, Jones had tempered expectations. "We felt like he was our kind of athletic lineman," he said. "We knew Samson was his (relative), so we kind of knew what we were getting. But still, there's a lot of ifs involved with a high school kid. You've gotta be dedicated, you've gotta work hard, and spend the time in the offseason to improve yourself. He did all those things." Junior slot back Davone Bess was named to the Walter Camp All-American second team last week.